The 2015 Asian Pacific Poker Tour (APPT) Manila is one of the must-attend Asian poker tournaments this month. It has currently been in full swing with a relatively good number of participants joining the poker room of Manilas City of Dream, in the Philippines. Kicking off the festival was a ₱ 10,000 buy-in Warm-Up event, guaranteeing an enticing prize pool of ₱ 4,976,100. 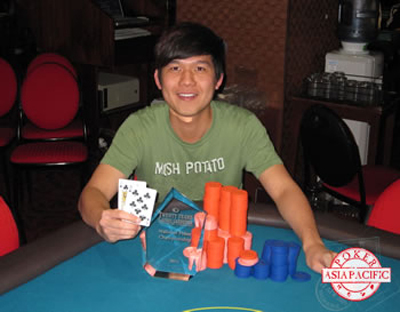 By topping a field of 570 players, Malaysias Alex Lee came up victorious of the battle and cashed the top payday of ₱ 1,082,200 .The pack actually saw Chinas poker pro Pete Chen in contention. However, he was sent to 3rd-place. Thanks to another final-table finish in a previous event, Chen now secures 3rd position in the Asia Player of The Year rankings. The verdict of the APPT Event # 3, a ₱ 2,000 buy-in No-Limit Hold'em Rebuy, is also in. It was Japans Hideki Takajufi who claimed the trophy by besting a 102-player field. Manila-based professional poker player, Charles Esteban, for his part, was the last man standing in the Event # 4, a Deep Stack Pot-Limit Omaha. He topped a field of 76 entrants. Speaking of the remaining gigs on the menu, there is still a series of alluring events of super attractive structures. After all, the Season IX of the APPT Manila will keep things in heat until August 9. The highlight of the festival: a ₱ 50,000 buy-in Main Event which will kick-off onThursday, August 6. Also on the menu are various lower-in satellite events, allowing the lucky ones to qualify for the Main Event.